Powazek: Just a Thought: JPG Issue 6 is here! Just a thought from 17 July 2006 about JPG Magazine. Whether it was faulty settings, old film, the random photo on the last frame of film, or the last photo a camera ever took, issue 6 features some of the finest slip-ups, freak-outs, and happy accidents ever captured on film or pixels. We're also joined by featured photographer Rion Nakaya, who shares some of her favorite serendipitous moments, and Ryan Gallagher, to talk about camera tossing. Check it! This section is called Just a Thought. It's a blog where I post little pieces of what I'm thinking about at the moment. 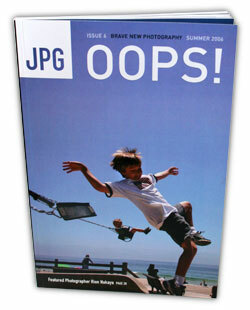 This page is an individual entry called “JPG Issue 6 is here!” that I wrote on 17 July 2006. Before this, I wrote a little something called “The Powazek World Tour” on 12 July 2006. After this, I wrote “Two Conferences, Two Weeks” on 25 July 2006.